In 2004, the Centre for Cultural and Media Policy Studies was awarded a three-year Research Fellowship, funded jointly by the Arts and Humanities Research Council and Arts Council England, in order to develop rigorous procedures for a better understanding of the social impact of the arts. The project started in November 2004, with Dr Eleonora Belfiore as the Research Fellow and Professor Oliver Bennett as Director. The research has been conducted with particular reference to poetry, the novel and theatrical performance. The second stage of the project has focused on the cognitive, psychological and socio-cultural dynamics that govern the aesthetic experience. This resulted in an extended paper, 'Determinants of Impact: towards a better understanding of encounters with the arts', which was published in Cultural Trends, vol 16, no 3, 2007, 225-275. It postulates that a better grasp of the interaction between the individual and the work of art is the necessary foundation for a genuine understanding of how the arts can affect people. Through a critique of philosophical and empirical attempts to capture the main features of the aesthetic encounter, the paper draws attention to the gaps in our current understanding of the responses to art. It proposes a classification and exploration of the factors – social, cultural and psychological – that contribute to shaping the aesthetic experience, thus determining the possibility of impact. The ‘determinants of impact’ identified are distinguished into three groups: those that are inherent to the individual who interacts with the artwork; those that are inherent to the artwork; and ‘environmental factors’, which are extrinsic to both the individual and the artwork. 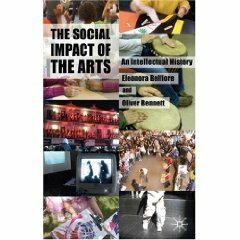 The paper concludes that any meaningful attempt to assess the impact of the arts would need to take these ‘determinants of impact’ into account, in order to capture the multidimensional and subjective nature of the aesthetic experience.